SUMMARY: Informative book that discusses parasites that take over the bodies and brains of their victims. REVIEW: Interesting with plenty of the "ewww" factor, Zombie Makers will be a hit with reluctant readers, science geeks, or those who just love to be grossed out. Each chapter includes pages packed with full-color close-ups (using photomicroscopy) of insects, fungi, worms, viruses, and other parasites that prey on their unfortunate hosts. For me, the chapter on parasitic worms (chapter 2) is particularly disgusting and make me really want to avoid drinking any water in Africa, where 3-foot long guinea worms wait for some poor soul to drink water containing water fleas, which host the guinea worms. The photo on p. 20 shows a human leg with a partially extracted guinea worm hanging out of it. The worms are considered "zombie-making" because the sore the worm creates in its victim's leg makes the victim want to jump into a lake or river, where the female guinea worm will exit the host's body and release millions of her larvae into the water. The larvae are eaten by the water fleas, and the cycle continues. Aye carumba, these things are creative! Other zombie-making parasites include two different wasps that inject their eggs into live bugs and caterpillars, rabies virus multiplying inside the saliva of mammals, a suicide worm that makes crickets jump into water and drown, and a parasite passed between cats and rats that can be passed to humans. Each different parasite's section contains the "science behind the story", a short paragraph or two that explain scientific studies on the parasite including how scientists discovered it and what we can do to prevent human infection. Zombie Makers includes an introduction tying the bugs to the zombies of modern movies and books as well as an Afterword that discusses the evolution of parasites and how they have adapted to ensure the survival of offspring. Each of the five chapters begins with a "Zombie Trait" such as "Stares vacantly ahead! Moves slowly and mechanically. Behaves oddly," (chapter 1), which further relates the book's subject matter to modern depictions of zombies. There is a Table of Contents, Author's Note, Glossary, Source Notes, Bibliography, More to Explore, an Index, and Photo Acknowledgments. Of note, the More to Explore section includes links and descriptions to websites and videos. I included one of the videos killer fungi below. It's only three minutes, but it is a must-see. Show this video to students, and this book will be checked out constantly. As an aside, while I was writing this review, a fly landed on my bare foot. I nearly jumped out of my skin! 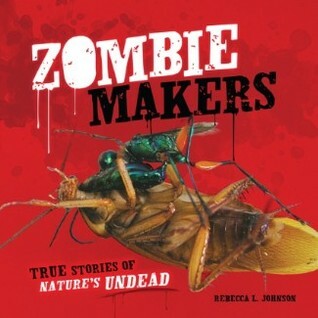 THE BOTTOM LINE: Amazing, disgusting, and utterly fascinating, Zombie Makers is a MUST in any library. Sensitive readers who are easily grossed-out might not be the best audience for this book, but many will absolutely devour it. STATUS IN MY LIBRARY: On order. I cannot wait to talk this one up with my students! Presentation & layout: 5/5--plenty of white space, every photo includes a short caption, lots of boxes to draw the eye to certain information, headings and subheadings stand out in a much larger, dark red font. Quality of information: 5/5--Except for the rabies virus, I had not previously heard of any of these parasites. Scientific information is presented in a conversational tone, which will really help to draw in reluctant readers. It's hard not to keep reading this one. Photos/illustrations: 5/5--LOTS of large, full-color photos! Every single page has at least one large photo, and many have multiple photos. Captions effectively describe each photo and will draw even the most casual reader to the main text on the page. Documentation of sources: 5/5--More than one full page of bibliographic sources, plus a fantastic "More to Explore" section referencing short videos and other books for further reading. I plan to use the books in this section when I order books for my library. Front and back matter: 5/5--Includes TOC, introduction, afterword, glossary, author's note, source notes, photo acknowledgments, and index. I would like to have seen a map of where these parasites are found included in each section. Want to avoid these things as much as possible!!!! Engrossing: 5/5--Oh yeah, I could not stop turning the pages. I even went back to previous sections after I finished just to look at them again. Writing: 5/5--Conversational tone is easy to understand and draws readers in. This is addicting reading! Appeal to teens: 5/5--Once I talk this book up with a few classes (and show the video below), I doubt I will see this book for the rest of the school year. Seriously cool stuff here! Appropriate length: 5/5--Interesting, colorful, and superbly done. THE BOTTOM LINE: A must for middle school libraries. Upper-elementary is also a possibility for students who won't get freaked out by the concept. One of the suggested video links in the "More to Explore" section of Zombie Makers. Show this to students and get ready for the hold requests!